This press release from the Mayor's Office of Transportation and Utilities (MOTU) just landed in our inbox. Starting tomorrow, MOTU and Center City District (CCD) will begin an experiment with "closing" the left-most lane of travel on these two streets between 15th and 20th. They want to test whether or not three lanes can handle the motor vehicle traffic that now enjoy four lanes. 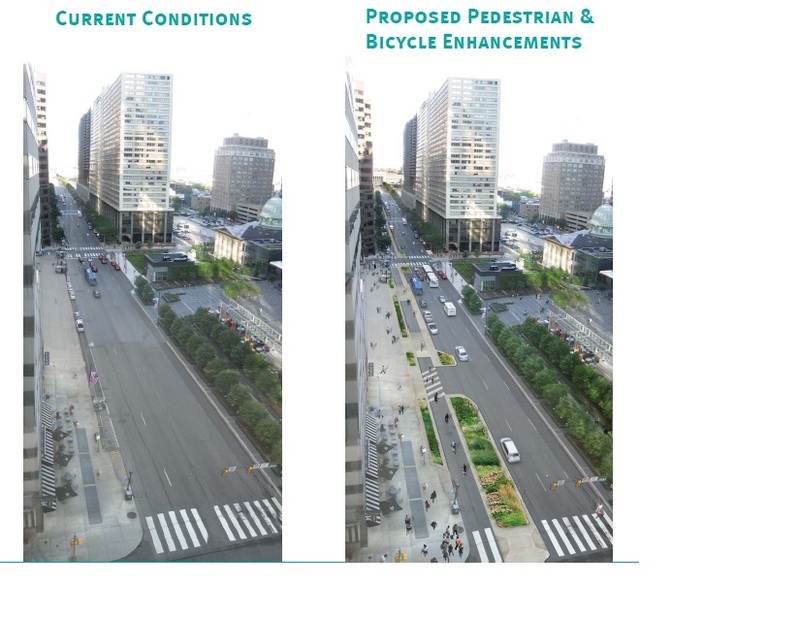 Ultimately, if the test is successful and enough funds are raised, MOTU and CCD plan to install physically separated bike lanes (cycletracks,) the first for Philadelphia. The lanes will be closed starting tomorrow through October 23rd. Between October 8th and 23rd the Mayor’s Office of Transportation & Utilities (MOTU) and The Center City District (CCD) will be testing the concept for some exciting changes to JFK and Market streets. The test project will temporarily remove the left-most lane of travel on these two roads reducing the four lane road to three lanes between 15th and 20th streets. During the two-week test Streets Department traffic engineers and CCD personnel will observe the capacity and overall environment of the streets to ensure that traffic functionality is maintained. On-street parking regulations will remain in effect and no parking spaces will be impacted. “We have a vision for a JFK Boulevard and Market Street that represents a truly complete street. The power of this vision is that every kind of travel, parking and loading zones are all accommodated in a way that is safe and convenient. Models tell us that Market Street and JFK Boulevard will work as well with three lanes as four, but there is nothing like a real world test. Over the course of these two weeks will have a chance to see if three lane concept could work.” said Rina Cutler, Deputy Mayor for Transportation and Utilities. 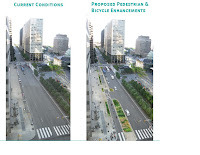 Following a series of analyses conducted for the Center City District by consultants JzTI and Parsons Brinkerhoff, a preferred option emerged that included a separated cycle track, the retention of three 10-foot-wide travel lanes, new landscaping, and parking and loading on both sides of the streets. These improvements would enable the region’s largest employment center to build on its existing transit-oriented strengths by adding state-of-the art bike lanes and improved pedestrian crossings. The planted medians can also provide stormwater management benefits as well. The Center City District has been working with the City of Philadelphia for over a decade to improve the Market West office district, successfully installing pedestrian lighting, new transit portal signage, street trees, and other amenities. I think two-way cycletracks on one side of a one-way street can work well. I do have concerns however when such a two-way cycletrack is placed on one side of a two-way street. I think in the later scenario street traffic just gets too confusing in part because one direction of bike would have to be on the wrong side of the ride where drivers don't expect them. The design illustrated below looks great! I wish the City the best in this project and congratulate them in trying an innovative project. I think it will bring new live to an otherwise desolate, gray avenue. This is great, but I question both the need for this road to be one-way and the need for more than two traffic lanes.